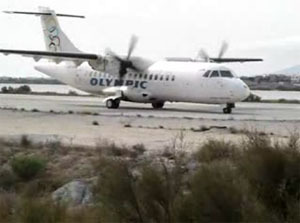 If you want to come to Naxos by airplane, there is one flight every day (two in the summer) with Olympic Airlines (Aegean Airlines) using a 50 seat - propeller shaft craft. It is a fast and nice fly (great view when flying over the Cyclades Islands) and the ticket costs about 65 Euro per person. Soft drinks are served during the flight. Make your booking in time because available tickets throughout the summer are quite rare.